There is a way to get to the core of the anxiety and worry you experience. Once you do, you’ll unlock the freedom you’ve been waiting for. For years, I struggled with chronic anxiety and tried lots of ways to manage it. But I really wanted to overcome it. Maybe you also want to be free from the grip of anxiety? Discover the difference between what happens in the mind and what happens in the body when anxiety hits. Learn to break the storyline in your mind from the physical symptoms of anxiety. You’ll be introduced to the ways to examine and break anxiety’s grip. 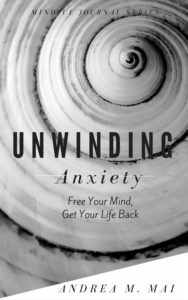 Unwinding Anxiety is filled with gentle practices to help you know your mind and body better. Pick up your copy today on Amazon.